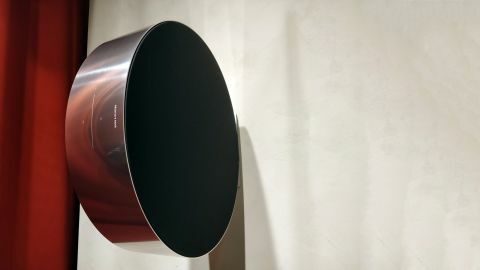 Bang & Olufsen Edge wireless speaker hands-on hands on review | What Hi-Fi? A speaker designed by an artist whose work is featured in collections in the Museum of Modern Art, New York and the V&A was never going to be a traditional rectangular box. For B&O’s latest invention, the Edge, its designer Michael Anastassiades was inspired by the British pound coin - presumably before it changed from a circular shape to one with 11 sides. The Edge’s inspirations are apparent with its aluminium circular ring casework - albeit resemblances are much fainter when it comes to size and value! The Edge costs a cool £2900 and is about the size of a car wheel. Pocket-sized it isn't. To continue the car analogy, the Edge features a patented Active Bass Port that works like a spoiler automatically raising as the car speeds up. The idea is that the level of bass is increased as the volume goes louder. Essentially it’s an amalgamation of the closed-box and ported speaker designs, so when playing at lower volumes it is using the closed cabinet principle, and when the volume's pumped it opens up to output bass frequencies. It’s one of the most interesting elements of the Edge’s engineering, and – as proven in our short demo of the speaker – makes for a distinct visual feature for anyone that dares to remove the cloth grille, too. We say ‘one of’ the most interesting because the Edge has another trick up its sleeve: motion control. Whether it’s sitting on a desk or floor, or hung on a wall, the user can push the Edge to roll it in order to increase of decrease the volume. The harder the push, the more dramatic the volume change. While perhaps not as practical as the touch interface built into the surface of the aluminium surround (which automatically illuminates when it detects your approaching, by the way), it’s a nice design trait. It doesn’t feel the most natural action at first (our first roll of an Edge hung on the wall was tentative to say the least) but it proved responsive. You can safely rely on B&O to turn an eye with an, ahem, edgy design though, so what about the sound? We had a short demonstration of the Edge at IFA, and it certainly held its own making a statement on the busy, noisy showfloor. The 10in bass driver, 4in midrange unit and three-quarter inch tweeter on each side of the Edge (driven by six Class D amplifiers in total) effortlessly spread the sound around the booth (as you may expect for a speaker of such stature), and the demonstration of the active bass port proved effective, with bass in no short supply as a thumping track was pushed to 11. It managed to stay composed at louder volumes, too. Like many B&O speakers before it, the stark clarity of the vocals stood out - although we’d have to have a longer, more controlled listening session to make any bolder claims about the Edge’s performance. But while we can't comment on the performance of the Edge, it's undoubtedly one of the most interestingly designed and engineered audio products launched at IFA 2018.